The agriculture sector in the United States depends upon exports for its vitality. Sales of U.S. agricultural products abroad are responsible for 20 percent of U.S. farm income, supporting more than one million American jobs on and off the farm, according to the U.S. Department of Agriculture. 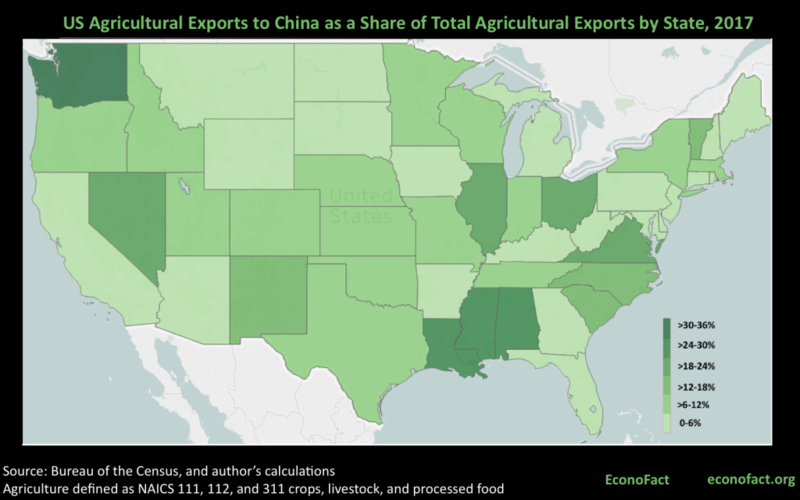 The three biggest buyers of American agricultural products are China, Canada, and Mexico. Yet trade with these three countries faces heightened uncertainty. The Trump Administration is in the process of renegotiating the North American Free Trade Agreement (NAFTA) with Canada and Mexico, which includes the option of exiting the deal altogether. In addition, the United States imposed a number of sanctions on our other trading partners, including China. These sanctions have spurred retaliation that has already harmed some agricultural exports. The entire memo is here. 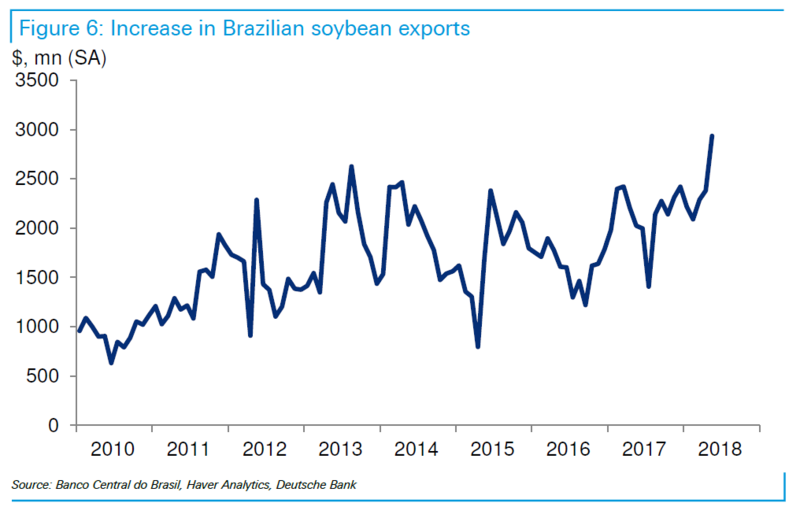 So far Brazil has benefitted from additional exports. 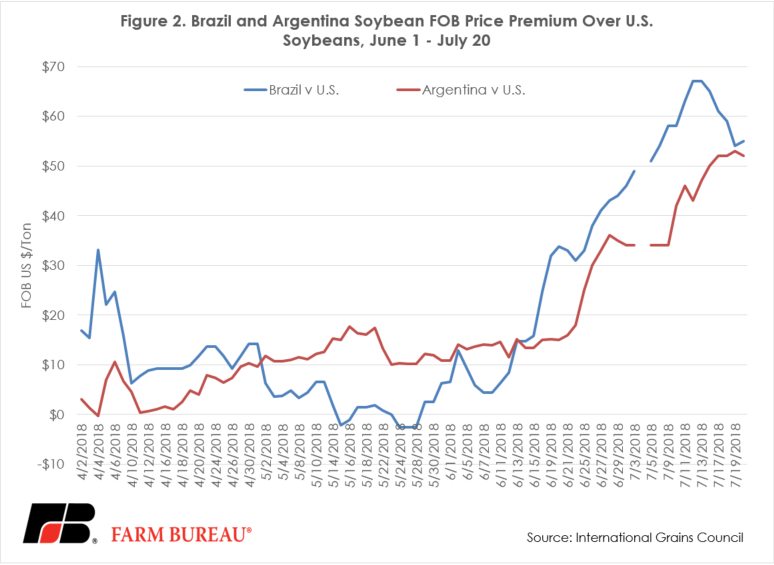 While prices for US soybeans have decreased, those of Brazil and Argentina have risen in relation. 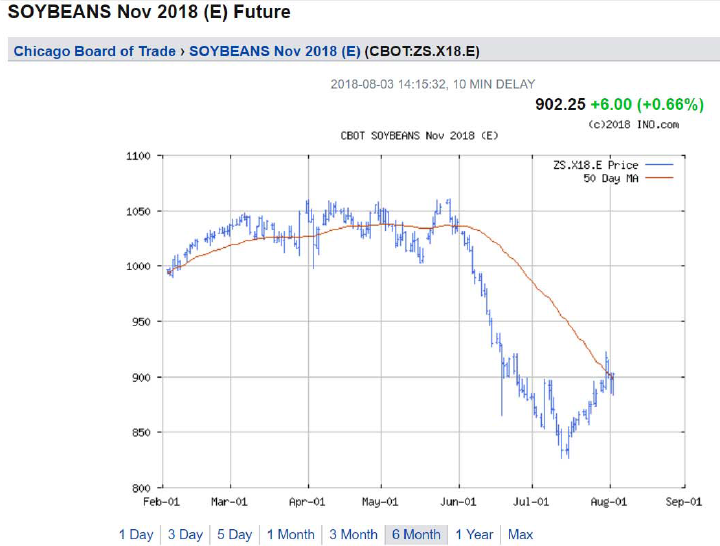 So the surge in soybean exports is transacted at a lower price than before. 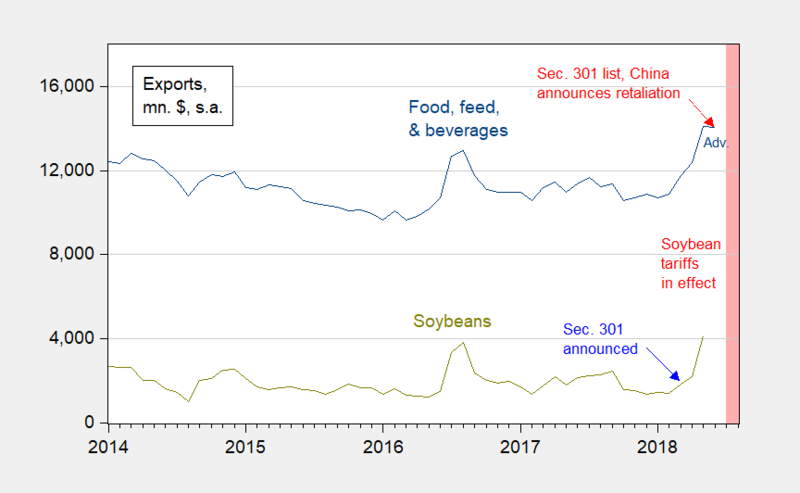 Brad Setser has calculated that the surge in 2018Q2 — trying to avoid tariffs — added about 0.5 ppts to real growth (SAAR). What happens next quarter? This entry was posted on August 5, 2018 by Menzie Chinn. This idiot thinks that foreign countries pay Trump’s tariffs. It is U.S. importers that pay the tariffs. Ultimately it is U.S. consumers who pay Trump’s tariffs. Foreign countries don’t pay a cent. I guess his logic fits with shutting down government if U.S. taxpayers don’t give him billions to build the wall with Mexico that Mexicans will pay for. All Trump knows is that it isn’t coming out of his pocket. A tariff is a tax on imported goods, designed to raise the domestic price for that good, whether it is manufactured domestically or imported. It is designed to benefit the domestic producer by creating a “rent” that increases the domestic producer’s profit (Nucor and U.S. Steel – both run by Trump cronies – profits), paid by the domestic consumer (right now canned food, made with steel cans is rising in price by 3 to 5 percent because of the cost of steel is rising.) Meanwhile, other domestic producers, who perhaps also export to foreign markets, are seeing their profit margins crushed as the trade weighted value of the dollar rises and rises. China, Japan, and Europe do not pay the tariffs. U.S. consumers do. And it is regressive, so the poor pay more than the rich. A perfect Republican tax, I guess since cronies make more money and the poor suffer more. Not much new drama here, other than announcing of more trumpian USDA welfare payments (redistribution of income taken from U.S. taxpayers) to farmers. And maybe some crunching of numbers for some more detailed accuracy from our friends Professor Chinn and Mr. Setser (which is important). Is this going to create a new urban myth about Cadillac driving farmers roaming the countryside in large packs that don’t sell any products to anyone and become useless “Welfare King Farmers”?? I know a lot of redneck farmers with barely a high school education get really angry when blacks from the inner city with zero good quality public schools, absentee fathers, and zero local job opportunities get federal money to help them subsist. But when those largely white male farmers who often got their farm by inheritance from their parents get welfare checks from the federal government, well “that’s the American way”. The illiterates like PeakIgnorance, CoRev, and Ed Hanson put those welfare checks right up there with apple pie and summer MLB baseball. Orange Excrement has now become the American farmers’ sugar-daddy. If the American farmer gets too rough taking Uncle Sam from behind on these welfare checks for producing products no one wants, I hope American farmers at least have the courtesy to give Uncle Sam a reach-around. That’s all our smelly mammal in the White House, Orange Excrement, would ask of anyone. Washington State seems to be heavily impacted. Why am I thinking about apples? The day job has got me talking to some really annoying international tax lawyers (what’s new) and some really stupid customs attorneys (yea the ultimate pain in the neck) and I was trying to come up with a story that captured a lot of the various issues in a really simple tale. Then a colleague asked me to read a Big Four accounting firm report for an apple concentrate manufacturer which was so lazy and stupid than even PeakyBoo might see the flaws. But within the occassional bits of useful information – a really instructive tale come forth that assumes that Canada and Mexico screw some Washington based producer and marketer of apple concentrate all of a sudden saw NAFTA collapse. OK – these nightmares should never inflict a multinational who is just trying to produce quality products and play fairly. But damn – Trump’s chaos has made my job so much easier! Given this administration’s nonsense on trade policy, if you are Mexico, do you wait until after the next election cycle to negotiate a new NAFTA deal? Looking at a Dem controlled House of Rep. or a possible impeachment? It looks like this admin. has backed itself into a corner on NAFTA. This is about a month old. Haven’t read all of it yet myself. But I’ve found myself agreeing with a good 85%+ of what Michael Pettis says, often with some insights that I hadn’t thought of before. Another bonus Pettis brings is he has actually spent what I would term “significant time” in China. What do I mean by “significant time” in China?? I mean living there and interacting with people, and people in different cities, provinces, and socio-economic groups. Not taking a week vacation there à la Ezra Klein and many TV reporters, staying at a 5-star hotel, wandering to the hotel bar, grabbing a Big Mac at the McDonald’s 2 blocks from the hotel, eating at the snob hangout that your phone app recommended and then trying to pass yourself off as a “China expert”. And flip through your cable channels in a 20 minute period and your apt to hit one of theses “China experts” randomly, who rarely know their head from their A__ in their own country, much less the way back to the main Shanghai hotel from the McD’s without their phone. When discussing specifically China, I put Pettis in that Chinn, Brad Setser group, a “go to” guy you can inherently trust to broaden your knowledge and get it right 99.99% of the time. Does this verbatim excerpt from Mr. Pettis sound oddly similar to what a certain Wisconsin based economist has been trying to pound into our heads for awhile now? ?